Raphael Ovesi is a former student of Empowering Lives’ Sustainable Agriculture and Community Development Program (SACDP) from 2011 to 2012. He comes from a family of eight siblings, plus his father and mother. He came to know the Kipkaren River Training and Development Center through his sister Lilian, also a former SACDP student of class 2010 to 2011, who spoke to him about how someone is empowered socially, religiously and economically if he joins the institution. In 2011, he joined the institution as one of the students. From the beginning, he displayed the qualities of working hard both in class and in the field. Against this backdrop of empowerment and success at the institution, it was amazing to discover how he used to raise fees to fund his education to ease the burden from his parents, who were educating his younger siblings. Raphael decided to help shoulder the burden of school fees by doing manual jobs like weeding people’s farms; harvesting and shelling maize; and feeding people’s livestock during school holidays. Despite the challenge of fees, he managed to graduate from SACDP in 2012. He continued to believe in God, whom he came to know here at the Training Center, and was blessed with a job at Nebert Ventures in Kipkaren as a farm manager. Upon visiting him on the farm, I discovered that he was in charge of crop and vegetable production and marketing. With the gifting of being a good mobilizer and a skilled farmer, he has managed to attract customers from the surrounding local community, schools and nearby market. On average, he supplies a total of 200 kilograms of vegetables a week with 10 different customers visiting the farm every day, each making an order of between 50 to 100 Kenyan shillings (approximately 48 to 95 cents). This translates into enormous economic transformation for both the company and himself. This economic transformation is seen through him where he is supporting his young brother by paying fees for Kisii University in Eldoret, where his young brother is pursuing a degree in education. Also from the little savings from his monthly salary of 8,000 Kenyan shillings ($76.11), he has managed to start a mini bakery to make mandazi (doughnuts) with the knowledge acquired from the center taught by the late Theresa Ngetich Bett. The business is at infant stage but doing well in the nearby Kipkaren market. He has employed three youths to assist with the production process, and he believes one day, he is going to have a full time bakery as well as be able to go back to school to further his education. On Saturday, March 17th a one day seminar was held at the KK Training Center for 19 farmers from Tebesonik AIC Church. This was a church had previously received some on-site training by SACDP teachers at their village in November and January. Today the farmers came to see and do practically what they had been taught earlier. The visitors were divided into two groups. The men went to the shamba (farm) to learn how to make vertical gardens, apply double digging techniques, and how to plant kale, cowpeas, spider plants, and tomatoes. The men also learned how to feed and care for dairy cows and how to construct a chicken house for local chickens and layers. 40,000 tree seedlings have been planted by this church member! On previous visits Isaac Mwebei, SACDP Coordinator, visited farmers to teach them about starting tree nurseries. One of the farmers was so inspired that he began with energy; he now has 40,000 tree seedlings! At this training Isaac explained how to maintain the seedlings. The farmers learned horticulture of crops that are grown in the training center such as passion fruit, sweet pepper, and citrus. As the men were going round, the women learned how to bake. Dorcas and the assistant teacher, Esther, taught the women how to make cakes, doughnuts and bread. This was successful and the women were very happy for they are able to do this by themselves now. As an expression of the deepening relationship between ELI and the Tebesonik AIC church the visitors extended their love to the ELI Kipkaren Children’s Home by donating a bag of maize. To be empowered seems to always create a desire to empower others. We are thankful for the blessing of such visitors! Every Friday the SACDP students leave the Kipkaren Training Center and go out into various villages to put their lessons into practice. As they near the completion of their second term of study, the students are eager to share the innovative agricultural practices they’ve learned with local farmers. Madam Edna and five students arrived to complete the banana planting they’d begun on a previous visit. Arusei appreciated the help they’ve given. “I’ve never seen banana suckers inserted in hot water before.” Placing banana suckers in hot water before planting destroys the nematodes that hinder banana production. This team also helped to plant a vegetable garden containing kale and cowpeas which will bring a nice income for Arusei in a few months. Mama Naomi Gets Bee Hives! Five SACDP students, along with their teacher Mr. Dan, arrived at Joseph’s home one final time to complete a local chicken house. This will increase egg production because chickens that are fed in a contained area are healthier than those that range for their food. Joseph is delighted that his hens will also be protected from dogs and cats; in the past he lost many chickens to predators but now his chickens have a good home. Mr Isaac Rutto brought his five students to Stephen’s farm to demonstrate the power of vertical gardens. Learning about farming in a small space will help him grow kale with an anticipated BIG harvest. The two vegetable beds that the students had planted in a previous visit are almost ready for harvest. Soon Stephen will be eating cowpeas! Madam Teresa and her five students received lots of congratulations from Jonah Bett for all they’ve done on the farm. Construction of a local chicken house, vertical gardens, establishing a nursery for kale seedlings, and banana pruning have helped greatly. All projects were completed well. This farmer was pleased to learn so many new things that he can apply easily, especially in the dry season. In preparation for their three month attachment with other institutions, the Sustainable Agriculture and Community Development Program (SACDP) students had a day of cooking. Using fruits and vegetables from the demonstration shamba (farm), the students learned how to prepare many different kinds of food. Bread, scones, cakes, pasta, vegetable salads, fruit puddings and soups were all part of the learning taught by Madam Teresa. This was a nice activity for the students as they will have many opportunities to teach farmers how to use their produce in innovative ways. We hope that this home economics lesson will even assist in generating some income for people in different communities. ELI’s Kipkaren River Training and Development Center strives to become more self-sustaining. A partnership between the training center manager and the Sustainable Agriculture and Community Development Programme (SACDP) Coordinator has sparked a clever idea – hot house tomatoes! The SACDP students have been learning how to erect community greenhouses, as well as different ways to grow vegetables year round, rather than depending solely upon water from the rains. In an effort to also assist the training center, tomatoes seeds were planted in a join effort to benefit the students with practical learning experience, as well as a financial gain for the training center. Village women commonly use tomatoes for most daily meals so selling tomatoes year round in our area is a great economic plan. We salute Edward, the training center manager, and Isaac, the SACDP coordinator for this great partnership idea! The thirty two students enrolled in the Sustainable Agriculture and Community Development Programme are making an impact in the local area every Friday. Over the years, each class has focused upon a different part of the greater Kipkaren area. Initially Chebaiywa/Kipkaren was the area of greatest need. Two years ago, Kenya Two was the area of outreach, followed by Murgusi. This year the students are crossing the Kipkaren River each week to assist impoverished families in the village of Ng’enyilel. 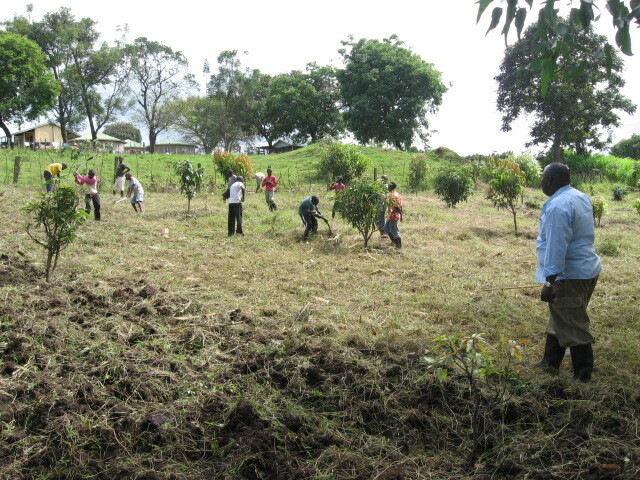 A recent Friday found the teams of students working vigorously on six different farms. “I have received angels on my farm, who have brought huge blessings to me that I’ve never had before,” exclaimed Mr. Jonah. Being on crutches has made it challenging for him to navigate his shamba (farm). The team of students visiting him helped to establish vertical gardens so he can access his sukuma crop more readily. From Learning to Life Saving! Brenda and Jenn look on as students use their wood stretcher during the seminar. In January this year, several people from the greater Kipkaren area were trained in CPR and First Aid by Jenn and Brenda, members of the Salem Team. Among those receiving training were the 32 Sustainable Agriculture and Community Development Programme students. One week after the Salem team left , there was an emergency at the training center. One of the students collapsed and fainted. The SACDP students quickly made a wood stretcher, using the techniques they were taught in the First Aid seminar. Due to their calmness and quick thinking they were able to carry the student to clinic where she received good treatment. Thank you Salem Team for sharing such practical knowledge with our community! Sustainability is an important concept within our organization. In all areas of empowerment we seek to create pathways where our work can generate resources for continued ministry health. Even at the Children’s Home, where our ministry is more helps oriented, sustainability is important. Check your mailbox this week for our newest edition of Cultivate Magazine – it’s hot off the press. It’s full of great stories, images, writing, and great ways for you to get involved this holiday season and help those that ELI serves in Africa. Click here to see the magazine.